Glitter decorating the streets, music vibrating in the air, floats dancing their way down St. Charles Avenue, flambeaux hoisting torches high. Carnival truly is a whirlwind for the senses. Celebrate this Mardi Gras season with accessories that will have you revelry-ready. 1. 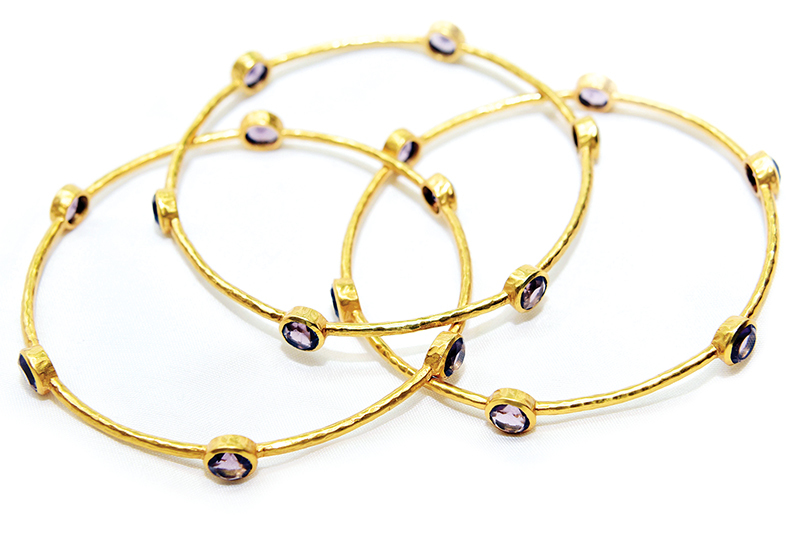 Tossing beads is even better when your wrist is prettied up with stackable Julie Vos gold bracelets with purple stones. Ballin’s LTD, 721 Dante St., 866-4367; 2917 Magazine St., 891-4502, BallinsLTD.com. 2. Give your little paradegoer a magic moment when all decked out in a bead unicorn romper. Bon Temps Boutique, 603 ½ Metairie Road, 571-5279. BonTempsBoutique.com. 3. Be prepared for any puddles in a pair of sleek splash proof sneakers available in olive, black and stone colors. Feet First, 4122 Magazine St., 899-6800, FeetFirstStores.com. 4. How ya gonna clap? With a gorgeous Italian hide Senape Holmes crossbody, accented with gold dipped hardware and custom-designed interior from local label BENE. FeBe, 474 Metairie Road, 835-5250, FeBeClothing.com. 5. Your favorite tiny dancer will bring the party to the parade line in a tutu with gold star accents. Relish, 600 Metairie Road, 309-3336, RelishNewOrleans.com. 6. Pay tribute to keeping the beat with hand painted, one-of-a-kind tambourine art from New Orleans artist Patricia Low. Home Malone, 629 N. Carrollton Ave., 324-8352, HomeMaloneNola.com. 7. Paradegoers will be green with envy over a pair of vintage inspired sunnies with honey and mint accents from Platoy. Art & Eyes, 3708 Magazine St., 891-4494, ArtAndEyesNewOrleansLa.com. 8. Giver your geaux cup a chic upgrade by way of stemless champagne flutes with metallic gold or silver accents. Party Cup Express, PartyCupExpress.com. 9. Every man is a King with a gold crown painted cufflinks and studs set in a gift box. Perlis Clothing, 6070 Magazine St., 895-8661, Perlis.com.